Ross Gordon, MA, MLIS, is a historian/ librarian whose special area of interest is Abbé Lionel Groulx and his influence on Quebec nationalism. Lionel Groulx was born in the village of Vaudreuil, near Montreal, on January 13, 1878. He died in Vaudreuil on May 23, 1967 and, in a most unusual gesture for a non-politician, was given the equivalent of a state funeral. Over his long lifetime he made a profound impact on the society in which he lived. He published 30 books of history and fiction, 20 shorter works and hundreds of articles, some under pseudonyms. ii He was a priest, an historian, a professor, an editor and a public speaker. He founded L'Institut d'histoire de l'Amérique francaise in 1946 and the Revue d'histoire de l'Amérique francaise in 1947. In 1956 the Lionel Groulx Foundation was created to which was added the Centre de recherche en histoire de l'Amérique francaise in 1976. There were few places in Quebec society where his name was not known, his influence felt. He has been honoured by the naming of public buildings, a college, a Metro station and even a mountain. Yet despite his years of influence and earnest work, he is a largely forgotten figure within modern-day Quebec. He first came to prominence in 1913 when he responded to the published complaint of Henri Bourassa, in Le Devoir, that Canadian history was not being given its due in universities and colleges in Quebec. Groulx sent a letter to Le Devoir promoting his own 900-page textbook that he had written on his own time and was swamped with requests. A teacher at the Valleyfield Classical College from 1900 (he was ordained a priest in 1903), he had begun writing his textbook in 1905 and had worked on it while spending three years in Europe studying philosophy and theology at the doctoral level. In 1915, after a sold-out series of public lectures entitled "Nos luttes constitutionnelles" that he gave at Montreal's then Laval University made a sensation, a chair of history was created for him to fill. It was from there that he worked tirelessly to revise French Canadian history, to attack the commonly held historical view that Confederation had been beneficial to French Canada and that the British had been generous in their dealings with the conquered French.iii It was from there, as well, that he influenced countless students, some to the point of political action. He is seen by many to be the spiritual father of Nationalist Quebec, a creator of separatist myths. With his stories of a mythical place for French Canadians called Laurentia and his version of the British conquest which he thought cruel and unjust, he may be viewed as a forceful propagandist in the fight for French Canadian rights and status as a 'distinct' society. He himself became an attractive target for counter propaganda that painted him in 'extremist' colours. His most controversial actions came under the pseudononymous guise of novelist and essayist. His book L'Appel de la Race, written under the pseudonym 'Alonie de Lestres' in 1922, is seen by some as having been "permeated with intransigent nationalism and racism and with frequent comparisons drawn from the history of other minority peoples." iv The protagonist, a French Canadian, is married to an English Canadian and finds over time that he is filled with shame for mixing the blood in his young children. Some call it racist, others say the story was merely metaphorical in nature; a microcosm of Canada at that time. Groulx often used the term 'race' when describing the French Canadian people. It was a popular term during his early years used to describe people, not so much genetically related, but as a cultural group, a 'people' in a way that the word 'nation' is used now. To readers of today his use of the term 'race' is surprising, even sinister. Groulx believed that he was writing propaganda for a conquered people who needed something to adhere to, so he created the French Canadian 'race' that was defined by its catholicism, language, history and resistance to the English conqueror. As a professor at the University of Montreal he strongly influenced the Nationalist school of history that spawned many of the academics who played a part in Quebec's quiet revolution. Groulx and his students followed the path originally blazed by the revered François-Xavier Garneau, Quebec's first 'national' historian.v For the older historians the British Conquest had disrupted a utopia known as New France and reduced French Canada to an unholy remnant open to exploitation and bad influences and finally to possible assimilation by her British captors. Garneau, then Groulx, gave credit for the survival of the French Canadian 'race,' to the Catholic Church which had organised the remaining communities and nurtured their culture. To these historians, survival of the 'race' was everything. Language, faith and customs, those things which made the French Canadian unique in the world, had to be safeguarded from outside influences, even if it meant turning a society away from progress and industrialization. He was a man of his times, sometimes speaking in the xenophobia: a hatred or fear of foreigners or foreign things.xenophobic cadences of the early 20th century, and it seems he is destined to remain there. The decline of Catholicism in Quebec is but one way that he is forgotten, the rise of a tolerant society is another. 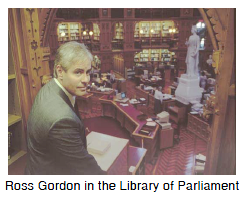 But he should be remembered as an historian who built, through prodigious writing, an entire library of works that became the foundation of a nationalist movement in Quebec. To understand the roots of this movement one should read his works. iHuot, Giselle. "The preacher (Lionel Groulx)" Horizon Canada, v7 (81) 1986, p.1940. iiIt has been estimated that he used between eight (Trofimenkoff) and over a dozen (Delisle) pseudonyms during his career. viCameron Nish, ed. The French Canadians, 1759- 1766: Conquered? Half-Conquered? Liberated? Issues in Canadian History. 1967.
viiHubert Guindon. Quebec Society: Tradition, Modernity, and Nationhood, p.xvii.